Sunny King NRC criterium summary – I survived to finish 36th place with well over 100 starters and only 73 finishers. I moved up quite a bit on the last few laps, but it wasn’t enough to get into the top 30. Considering how hard the race was and how bad I felt early on, during the middle, and then late in the race, too – I was surprised to be able to finish at all, let alone move up so far by the end. It is easily the highest heartrate I’ve ever had in a race of this distance. There really isn’t much to report about the race. It started out really hard, stayed really hard, and never really let up. The speed was slower than previous years, but the race was harder. The annotated photo below the heartrate data is a visual picture of why the race was so hard – turns 3 and 4 this year were much slower than previous years. But the start/finish stretch was just as fast normal. This meant that the further back you were in the group, the faster you had to reaccelerate up over 30mph EVERY lap. Our average speed was 27.5mph with at least 1/4 of the course (heading into turn 3 and then all the way through turn 4) at less than 25mph, which means the rest of the course was really fast. Check out the stats, photos, videos, and statistics for the details! 2011 Sunny King heartrate summary – 93% of the race spent in Zone 5! 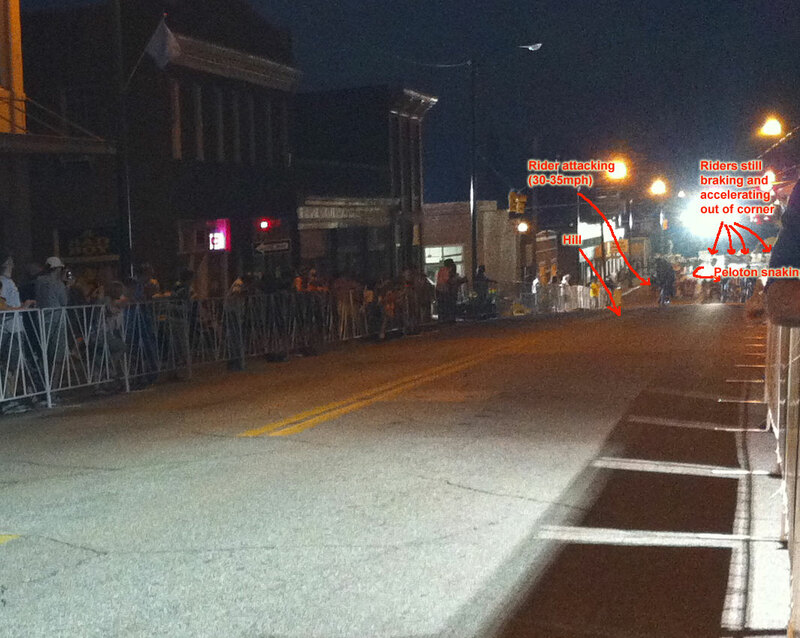 Annotated photo showing what makes the race so hard! I’ve got some good videos of the Cat 4 race I will post tomorrow. Ed Merritt and Brandon Thorton both rode really strong in their first Cat 4 race. Ed took 4th and Brandon was in the top 10. JD also had a great ride, and overall it was a really showing by BBC who factored into just about everything in the race. Foothills Road Race report – Last year, there were about 60 guys in Sunday’s race. This year, there were over 100! And many of those racers were strong pros looking for some Tour of California hill training and just looking for a good hard road race. Well, they found one for sure! Here is how the race played out. We started at 8AM in the morning just over 10 hours after finishing our hard criterium the night before. I was suspecting that an early break would be let go because of how hard the race was the previous night. I was hilariously wrong. Riders were attacking from the start line. We were not reminded of a yellow-line rule before the start, so many of the pros who are used to racing on closed roads attacked from the start line on the wrong side of the road. In fact, the entire group of 100 riders was strung out single file within 500 meters of the start on the WRONG side of the road. I was chuckling and all of a sudden VERY excited about the race. Bill did a great job of getting us all back on the correct side of the road, but with such a large group and so many pros anxious to attack and/or chase down breaks, it was pretty much impossible. Bill made an excellent decision to stop trying to keep us on the righthand side of the road. Instead he rode his motorcycle in front of us to block oncoming traffic, as well as getting a police car to go well in front of us on the descents to make sure that all oncoming traffic was stopped at the base of the hill. One of the Hincapie development riders went off the front after the initial flurry of attacks and rode solo for a few miles leading into the first climb. We caught him on the climb and flew up the climb, but no break could be established with so many strong teams in the group. There was a pretty steady stream of attacks that were all brought back. I attacked at about the same place where Travis Sherman and I bridged up to the winning break last year. It turned into a good break of about 6 guys with Bissell, Kenda, Team Type I, and Pure Black represented, but we couldn’t get a good rotation going with everybody going a different pace on the hills, so our break was doomed just like all the others before it. The break that stuck went shortly after ours on a slight downhill leading into a long less rolling section of the course. There was representation from seven pro teams (Kenda – Johnny Sundt, Team Type I – Ty Magner, Bissell, Kelly Benefits, Mountain Khakis, Real Cyclist, and Pure Black (New Zealand)) so nobody was motivated in the group to chase and our pace plummeted. 1) The Real Cyclist and Mountain Khakis riders were dropped from the break. 3) We went over two Cat 4 climbs back to back. I felt good on the climbs, but still found myself about mid pack on both of them. The descent after the second climb was AWESOME. It was full of tight, banked switchbacks and we were flying down it. Unfortunately, Brent Mahan (Nashville Cyclist) went down on one of the corners but was able to get back up and finish the race minus some skin. By the time we made it to the bottom of the second descent, both the Real Cyclist team and Mountain Khakis were at the front leading the chase. Behind them sat Bissell and Kelly Benefits. Then behind them was everybody else fighting for position trying to stay on the correct side of the road (but many times spread completely over the road). Eventually, I was tired of being way back in the pack and pulled out into the wind and moved all the way up to sit in front of Bissell and act as the gatekeeper for the riders who were working. I don’t think Bissell was happy about it, but we were still far enough out from the finish that they really didn’t care either as long as I was the only one in front of them. As we got closer to the steep rollers and the final climb near the finish, positioning became an all-out battle. I was pushed farther back in the group and fought hard to stay right behind the Bissell and Kelly Benefits trains. I had to fight some wind, too, but it was worth it to be able to keep my position close to the front and stay out of trouble with some 50+mph short steep downhills. I heard screeching brakes more than one time during this section. We made it to the final climb, and the break was visible higher up on the climb maybe about 30-45 seconds in front of us. Cesar Grajales put in a strong attack and got some separation, but a group of about 20 riders including me bridged back up to him on the descent. Another 20-30 riders bridged across to us a couple miles later right about the same time that a string of attacks led us to catching the break of five riders with less than 2 miles to go. I was fighting hard for position at the front when a Garmin development rider grabbed my jersey and pulled back on me. I guess I didn’t look “pro” enough to be fighting for position with the leadout trains of the other teams. But I paid my money to race, and believe you me, I was going to race! I entered the sprint in great position and was riding with very little effort in the draft of a strong Kelly Benefits rider (Dan Holloway?) when I decided to give it a go with 150 meters to go. Well, there is a big difference between drafting a large rider at 40 mph and trying to fight the wind at 40mph. I had such a good draft that I didn’t realize how much I was just being sucked along. When I pulled out into the wind to sprint, I was promptly passed by 3 or 4 people who started their sprint from behind me. I did end up passing a couple other people, but I would have been much better off just staying on the Kelly Benefits rider’s wheel. I ended up 14th, when I was really aiming for a top 10. Cole House (Real Cyclist) took the sprint win. Disappointing finish for me, but the race was definitely raced at nearly the same caliber as an NRC road race. I would normally be ecstatic about a top 20 in any NRC event, so I am trying to convince myself that 14th is OK given the quality of the field and the intensity of the racing. This entry was posted in Racing and tagged criterium, nrc, photos, road race, videos on April 11, 2011 by kartoone. UPDATE – Nevermind, I made the mistake of taking the last flight out of Birmingham. The flight has a flat tire, which they are replacing in about an hour, which means I miss my connection to NY. There is no way I can make it to the race in time! I’m privileged to be racing tomorrow in the last race of this year’s NRC series – the Chris Thater Memorial criterium up in Binghamton, NY. This race is also part of the USA Crits series where I am currently still holding my position in the Top 10. 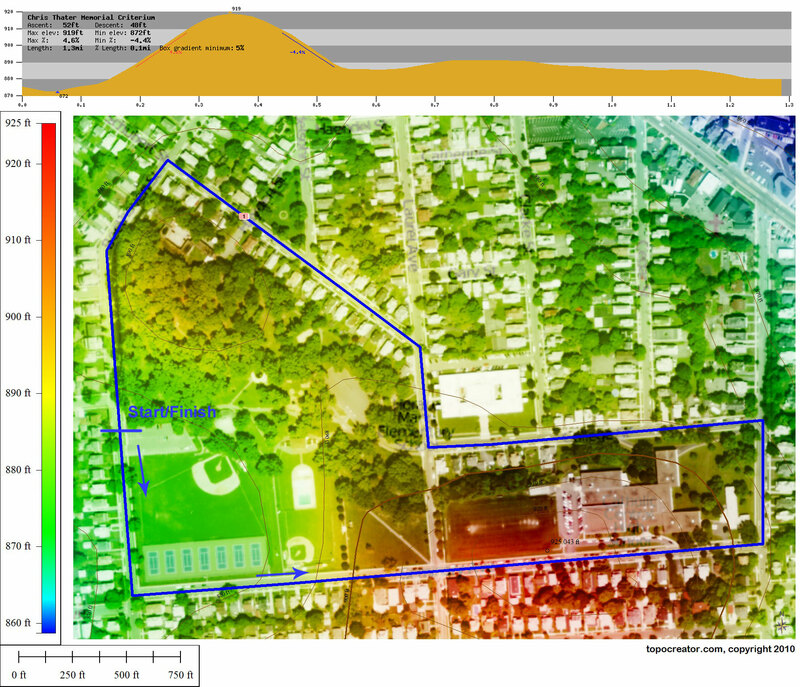 Here’s my topocreator map of the course … at 1.3miles long, this is a bit longer than a typical crit course. We’re supposed to be racing 50 miles, so I guess that means about 38, 39, or 40 laps. This entry was posted in Racing and tagged criterium, nrc, race, usacrits on August 28, 2010 by kartoone.